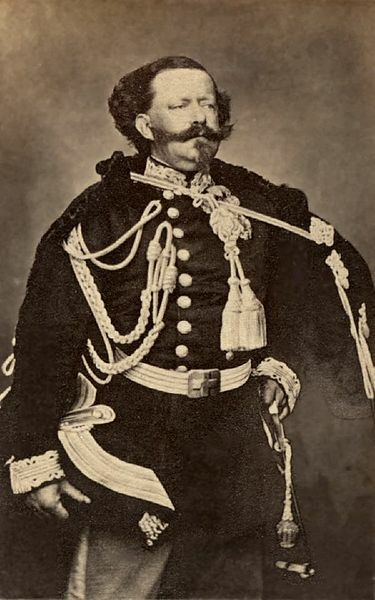 In 1855, King Victor Emmanuel of Sardinia visited England. Queen Victoria wrote to her uncle, King Leopold I of the Belgians, about this visit, sharing her opinion on their royal colleague. The last part of the letter is, instead, about her eldest daughter Victoria, who is about to marry Friedrich Wilhelm Nikolaus Karl, known informally as Fritz, heir to the new German empire. In a previous letter, the Queen had asked for his blessing for the match. Windsor Castle, 5th December 1855. My dearest Uncle,—I must make many excuses for not writing to you yesterday, to thank you for your kind letter of the 30th, as on Friday and Saturday my time was entirely taken up with my Royal brother, the King of Sardinia*, and I had to make up for loss of time these last days. He leaves us to-morrow at an extraordinary hour—four o’clock in the morning (which you did once or twice)—wishing to be at Compiègne to-morrow night, and at Turin on Tuesday. He is eine ganz besondere, abenteuerliche Erscheinung, startling in the extreme in appearance and manner when you first see him, but, just as Aumale says, il faut l’aimer quand on le connaît bien. He is so frank, open, just, straightforward, liberal and tolerant, with much sound good sense. He never breaks his word, and you may rely on him, but wild and extravagant, courting adventures and dangers, and with a very strange, short, rough manner, an exaggeration of that short manner of speaking which his poor brother had. He is shy in society, which makes him still more brusque, and he does not know (never having been out of his own country or even out in Society) what to say to the number of people who are presented to him here, and which is, I know from experience, a most odious thing. He is truly attached to the Orleans family, particularly to Aumale, and will be a friend and adviser to them. To-day he will be invested with the Order of the Garter. He is more like a Knight or King of the Middle Ages than anything one knows nowadays. On Monday we go to Osborne till the 21st. One word about Vicky. I must say that she has a quick discernment of character, and I have never seen her take any predilection for a person which was not motivé by personal amiability, goodness, or distinction of some kind or other. You need be under no apprehension whatever on this subject; and she has, moreover, great tact and esprit de conduite. It is quite extraordinary how popular she is in Society—and again now, all these Foreigners are so struck with her sense and conversation for her age. * Footnote 97: King Victor Emmanuel was received with great cordiality by the English people, grateful for his co-operation and for the gallantry of his soldiers at the Tchernaya. Count Cavour accompanied him, and drafted the reply read by the King at Guildhall to the address of the Corporation.